Chalet l'Acinos, location appartement Montgenèvre, Hautes Alpes, France. 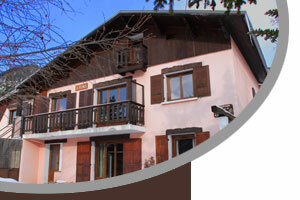 The chalet is ideally located, south side, facing the slopes and 250m from the village of Montgenèvre. Apartment of 110 m2 on ground floor. 5 parts: a bedroom with two single beds (joinable), a bedroom with double bed, a bedroom with 4 single beds, a large living room. One bathroom with shower and toilet. A bathroom with tub. A separate toilet. A separate kitchen with 4 gas hobs, fridge, oven, lwith dishes, small appliances. Washing machine. Television. Le chalet l'Acinos est situé rue des Montagnards (C4 sur le plan).